If one lives alone or far distance from a spouse, partner, or child, that person is or will be an elder orphan. It's hard enough to grow older with family near, but when an individual has no one to count on for help, it can be unhealthy and depressing. I admit, the aging-alone series is for my benefit since I live without an immediate family. But as I help myself, it will help others who live in a similar situation. Besides, where's the fun in planning if done without input and suggestions? Since I work in the senior care industry at Seniorcare.com and have been a family caregiver, I feel confident the plan will be thorough. If you've kept up with the series, you know that there are 22 percent of Americans (65+) in danger of becoming an elder orphan. And the entire older population will grow to 98 million by 2060 according to the AoA statistics (2013). The chances are high that many will live alone without a family member to help out. In recent articles at Huffington Post and elsewhere, people joined in to discuss and share their deep concerns and doubts about aging alone. The common ones are fear of isolation, high-cost housing, growing healthcare expenses, rising cost of living, inability to care for self, and a lack of community support and services. I have moved to Panama. I'm surrounded by caring expats, good affordable health insurance, and health caregivers. I live comfortably on less than $1000 a month. I would highly encourage others to think outside the box and look at opportunities outside the US for retirement. Where I live in Panama, we have over 30,000 North Americans living, and more are coming every day to find a better way to live in retirement years. Learning to cope in the US is not the only choice. Take back your life. I live in an area where there is a large population of seniors, and many of them likely fall into this category. I know our city has many programs for the seniors living here, but I do worry that those who are already feeling isolated and lonely aren't utilizing the services. I'm very interested in women's communes, shared housing, etc. Have no family, so this is about being alone. In reasonably good health, still working part time; likely will continue that thread. I would like to feel safer about living arrangements/options. Several of my friends and I are in our 40s and have started a discussion. We have opted out of the marriage-and-kids paradigm, so we do not expect to have significant others or offspring to help us. We are looking into building a community of tiny houses with shared resources such as common spaces, health care providers, activities, buying in bulk, etc. These are my preferences. What are yours? Support--a group that provides a space for comfort and camaraderie. It's a gathering of like-minded folks with a common interest to express feelings and preferences, lend an ear, and answer questions. We're in this together. Practical support--that type that helps with detailed strategies and tips to guide us. It could include ideas on transportation help, finding the right type of housing, all the "how-tos." Resources and guides--as the group expands, imagine the resources that help us decide how, and where we want to live. It's fun to think about the possibilities, right? 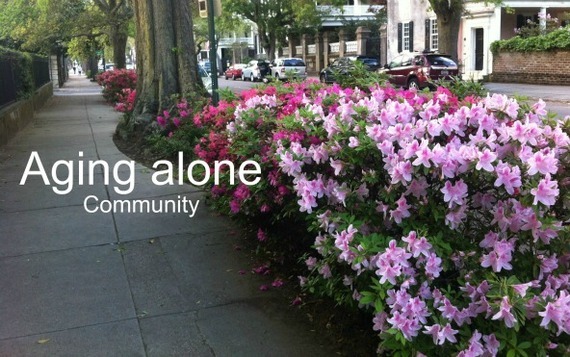 Are you 50 plus, living alone with no immediate family nearby? If so, head over to Elder Orphans at Facebook. It's a closed group, but don't worry, if you fit the criteria, you're in!